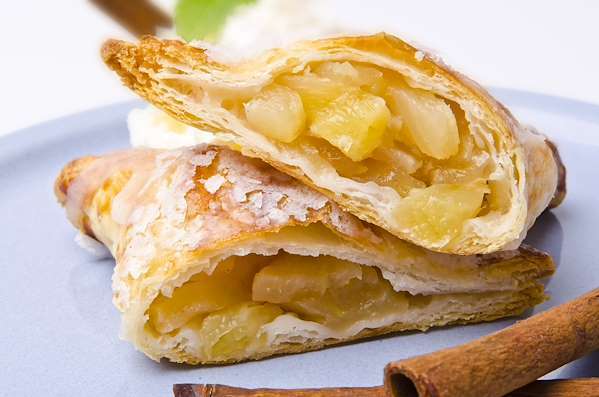 Instead of buying apple turnovers at the bakery, discover how easy it is to make them from scratch! This recipe uses buttery puff pastry from the grocery store, for convenience. Prepare the apple filling in a saucepan, fill the pastries, then brush with an egg wash. They are golden brown in about 30 minutes, and ready to serve after they cool. RecipeSavants.com Instead of buying apple turnovers at the bakery, discover how easy it is to make them from scratch! This recipe uses buttery puff pastry from the grocery store, for convenience. Prepare the apple filling in a saucepan, fill the pastries, then brush with an egg wash. They are golden brown in about 30 minutes, and ready to serve after they cool. Smart Recipes, American Recipes, Eggs,Vegetables Recipes, Recipes Eggs,Vegetables American Apple Turnovers PT45M Serves 4 Ingredients: 4 Medium Apples 2 Tablespoons Butter 0.5 Cup Packed Brown Sugar 1 Teaspoon Ground Cinnamon 2 Teaspoons Cornstarch 1 Pound Frozen Puff Pastry 1 Large Egg Heat oven to 400 degrees. Line sheet tray with a sheef of parchment paper. In a saucepan, combine apples, cinnamon, cornstarch, butter and brown sugar. Bring mixture to boil over medium-high heat, and reduce to a simmer for 5 minutes, or until the mixture is thick. Set aside. Roll thawed puff pastry into a 15-inch square. Cut into 4 equal quarters. Brush with egg wash, then add 3 tablespoons of the apple mixture into the center of each square. Fold the squares diagonally to form a triangle. Seal edges well with fingers, then crimp edges with a fork. Place turnovers on a sheet tray and brush them with remaining egg wash. Cut a few steam vents in each one. Bake for 25-30 minutes until golden brown. Cool on wire rack. If you enjoyed this easy apple dessert, you'll love these fresh ideas! 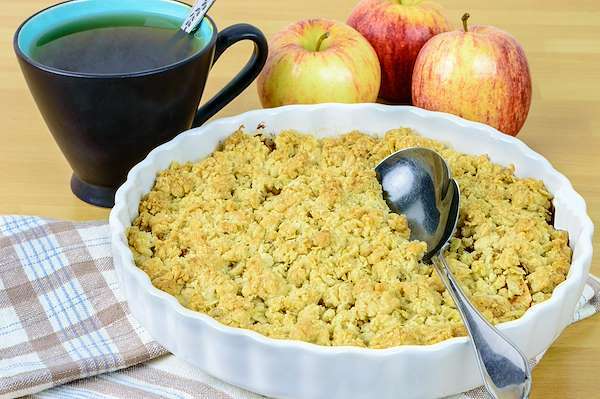 This easy apple brown betty recipe includes tender apples baked in a sweet cinnamon syrup and with a buttery crumb crust. Serve with a scoop of vanilla ice cream, if desired. This is comfort food at its best! 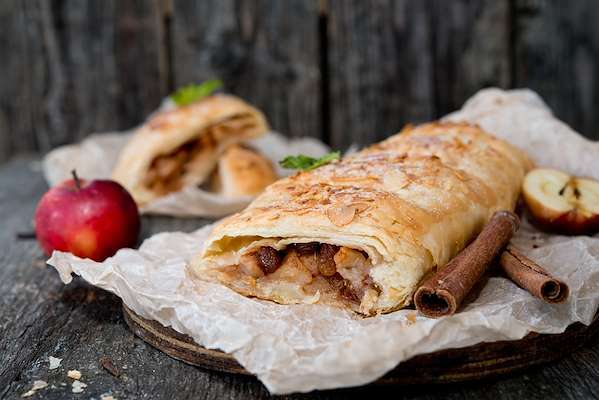 Put your apple harvest to good use and bake this tempting Viennese classic! The flaky dough is easy to make, and you fill it with tender apples, plump raisins, and plenty of warm cinnamon and sugar. It bakes into a lovely golden- brown roll that you can dust with powdered sugar and enjoy. 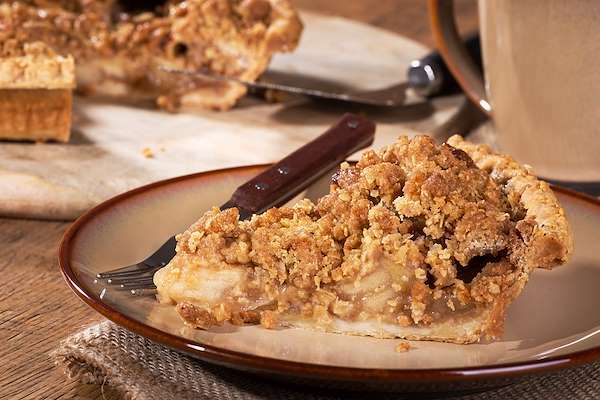 Featuring the first apples of the season, flavored with cinnamon and nutmeg, this Dutch apple pie is created with the pre-made crust, and is the stuff celebrations are made of. Serve this dessert at your next party, and wow your guests.